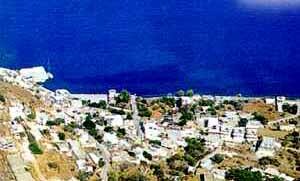 Tilos Island, Dodecannese Islands, Cheap Hotel Reservation, Travel & Discount Hotels Guide. Tilos is a small and very pleasant island between Nissiros and Symi. It is a blissful tranquil heaven inhabited by very friendly people. The food is excellent and cheap. The taverna Blue Sky served probably the best Stifado I have ever tasted, among other delicious treats. Tilos even has it's small share of sightseeing. Most notably the hillside villages of Mikro Horio (deserted and in ruins) and Megalo Horio (the "capital" of the island), and some castles. Tilos has some very nice paths left that will keep you busy for a few days, at least. Most of the paths are rather short and pretty undemanding, making this island a very relaxed experience. Many decent beaches can be found on the way, where you can enjoy a nice swim in more or less complete solitude. The charming little port of Telos, at Livadia bay, can serve as a convenient base for your walks.